Is your big toe leaning more and more outwards, crowding the smaller toes on your foot? Do your feet hurt after longer walks or often even at the start of the day? Is this pain restricting your flexibility and mobility in your daily activities? Then just like so many of the other - mainly female - patients of our foot and ankle department, you’re suffering from hallux valgus (bunions). 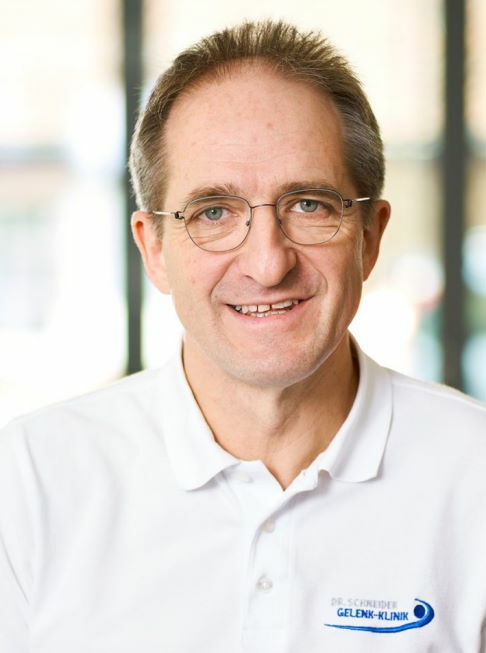 The experts in our foot department specialise in the gentle treatment of misalignment of the big toe with minimally invasive procedures on the forefoot. 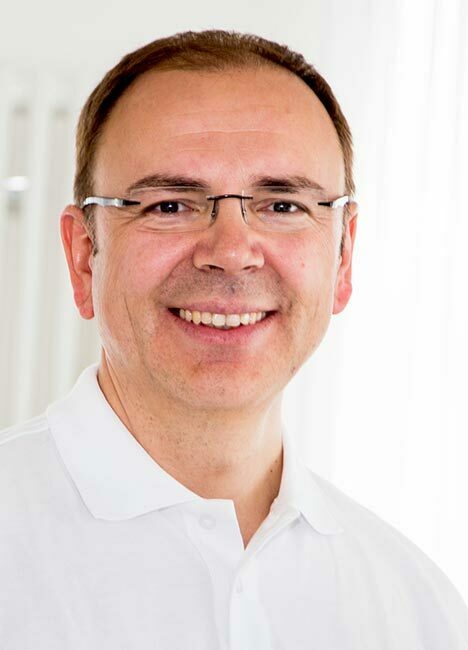 What is particularly important to our many patients from Germany and abroad is: It significantly speeds healing and rehabilitation and prevents complications. The goal of hallux valgus treatment is this: We want our patients to regain their mobility as quickly as possible and experience permanent medical and cosmetic improvement of their hallux valgus. The goal of hallux valgus surgery is to restore a resilient, pain-free foot with a cosmetically beautiful shape. In the following article we will discover which goals can be achieved through hallux surgery. The more severe the hallux valgus deformity, the more complex the surgery will be. That is a reason to see a specialist for gentle options to correct hallux valgus early. Hallux valgus (bunions) is a very widespread misalignment of the big toes. The big toe noticeably drifts to the outer edge of the foot, where it also crowds the smaller toes. With the hallux valgus deformity the metatarsophalangeal joint is overstrained and as a result painful →arthritis of the big toe (hallux rigidus) can develop. The protruding bunion at the metatarsophalangeal joint becomes inflamed and painful and can swell. There are numerous conservative procedures to treat hallux valgus and to alleviate pain. Indications for surgery: When does hallux valgus require surgery? What causes Hallux valgus pain? The bunion, tender to pressure, becomes inflamed and pushes against the inside of the shoe. The crowded small toes (hammer toes and claw toes) cause further forefoot deformities. Pain occurs in the arch of the foot, because the big toe is no longer being fully utilised and the small toes are overstrained. Arthritic pain in the metatarsophalangeal joint occurs due to wear of the joint. Hallux valgus is a cosmetic problem for many female patients - especially in open-toed shoes. But cosmetics alone are not a reason to operate on this misalignment. When planning and performing this plastic surgery of the big toe we do, however, pay great attention to an appealing cosmetic result. 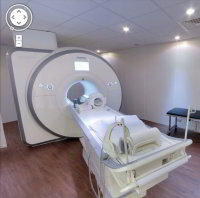 This allows us to fully restore the quality of life of our patients. One requirement for surgery is a painful misalignment. This is a misalignment of the big toe. This can also not be treated by changing shoes, using insoles or foot exercises. Although insoles may provide relief for painful hallux valgus. However, they do not correct the misalignment. Correcting hammer and claw toes. Removing the swollen ball of the foot (removal of exostosis). Minimal surgical scars in the visible area. Only when the feet have a significantly lower weight bearing capacity in everyday life, the bunion are already painful and mobility restricting, it is medically justified to recommend the operation. Osteoarthritis of the big toe (metatarsophalangeal joint (hallux rigidus). Bursitis (bursa inflammation) on the toe pads. Bursitis at the adjacent lesser toes. Hallux valgus is always a combination of various pathological processes. The misalignment of the big toe is accompanied by, for example, skin alterations and bursitis. The crooked big toe crowds adjacent small toes. This results in painful strain. We want to gain an understanding of the patient’s specific condition through thorough diagnosis before planning surgical treatment. Below we would like to present an overview of the standard hallux valgus surgeries. But first we would like to stress each patient’s specific case and lifestyle affect the decision whether to perform the hallux valgus surgery. An experienced specialist plans the specific hallux valgus surgery and agrees it with the patient. This straightens the foot ray. A rigid misalignment can be straightened by correcting the joint capsule. 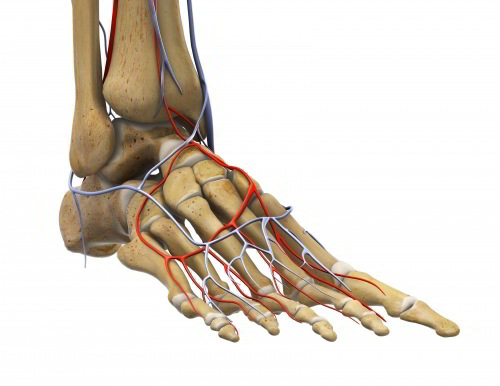 The length of the tendon must be corrected so the pull of the tendon does not deform the big toes again. Joint-preserving cheilectomy (removing bone spurs) or fusing the metatarsophalangeal joint (arthrodesis) for severe arthritis. The orthopaedist will only consider hallux valgus surgery once all conservative hallux valgus treatments have been exhausted. Long-term effects of hallux valgus often include arthritis of the metatarsophalangeal joint: This sometimes also ends in limiting the flexibility of the metatarsophalangeal joint. How can a patient prevent hallux valgus surgery? Switching to healthy shoes with a large toe box and consistent conservative hallux valgus treatment can delay the progression of hallux valgus. Therefore once you notice a hallux valgus deformity you shouldn’t wait too long to start treatment. What to do if conservative hallux valgus treatment doesn’t provide relief? Increasing stiffness of the big toe joint and the misalignment of the adjacent toes of the foot make hallux valgus more complex to operate on over time. Long-term complications such as hallux rigidus (arthritis of the metatarsophalangeal joint) increase in severity. Following hallux valgus surgery most patients are glad to no longer have to endure the pain, limping and cosmetically unattractive misalignment. In addition to straightening the big toe, the goal of treating hallux valgus (bunions) surgically in early stages is to preserve the metatarsophalangeal joint at risk of developing arthritis. So hallux surgery permanently corrects the hallux valgus deformity. The function - the natural gait - can only be restored once the feet are returned to their natural shape: In a healthy gait the foot rolls off across the big toes. This rolling movement is distorted in hallux valgus. The small toes assume this rolling movement: This stresses them, deforming them over time. The hallux valgus-induced crooked bone axis of the big toe is straightened through hallux valgus surgery. The pull of tendons and muscles is normalised through hallux valgus surgery. Otherwise with hallux valgus they would pull the big toe more to the side with every step. It’s therefore important to operate gently on the muscles and tendons surrounding the big toe and injure them as little as possible during hallux surgery. The distorted alignment of the joint is restored as much as possible. Hallux surgery permanently improves the inward rotation of the toe (pronation). During hallux valgus surgery we also always consider the position of the sesamoid bones: A sesamoid bone (lat. Os sesamoideum) is a small bone which rests on the tendon. These sesamoid bones freely suspended by the tendons are small spacers between the tendon and the bone. They ensure the minimal distance to the bone necessary for optimal tendon function. Hallux valgus surgery also needs to adjust the position and function of the sesamoid bones: The sesamoid bones impact the misalignment of the big toe due to the draw of the tendon, which in turn intensifies the hallux valgus. The main contraindication is peripheral arterial disease (PAD). A circulatory disorder can result in serious wound healing deficits following surgery. In these cases we need to thoroughly examine circulation of the foot before deciding to perform hallux valgus surgery. Polyarthritis and rheumatic diseases are not contraindications for hallux surgery. However, they must be considered accordingly when selecting the surgical method. Even prior hallux valgus surgery significantly complicates repositioning surgery and can impair the expected result. 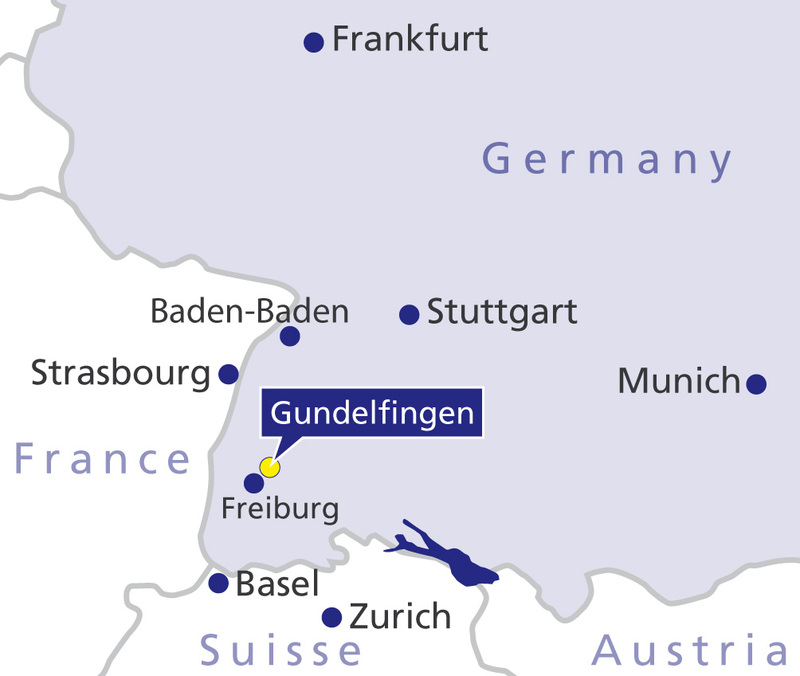 There are several internationally established and proven surgical methods for correcting hallux valgus, which we also use at the orthopaedic Gelenk-Klinik. The following principle applies: The more severe the misalignment, the farther back on the foot ray the big toes need to be operated on and corrected. The more severe the misalignment, the longer the healing process and follow-up treatment will be. With a severe misalignment, which is often accompanied by arthritis of the big toe, the long-term result and the load-bearing capacity are also the same as after minor misalignment. The surgical options for minor misalignment start in front of the metatarsophalangeal joint. For a moderate misalignment the surgery is performed on the metatarsal bone. 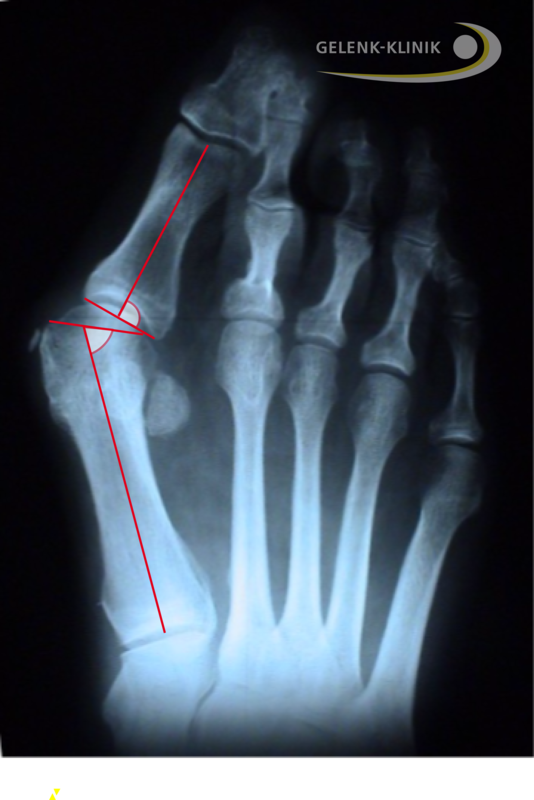 For severe hallux misalignment the repositioning or fusion is performed at the metatarsophalangeal joint: This is the connection between the metatarsal bone of the foot ray and the tarsal bone. These hallux valgus surgery techniques aimed at the positioning of the big toe and the metatarsophalangeal joint are always accompanied by associated procedures on the soft tissues (muscles, capsules and tendons). Which technique is used for each individual case depends on the anatomic location of the deformity and the severity of the misalignment. The orthopaedist chooses the suitable hallux valgus surgical method together with the patient: The options for treatment are discussed with the patient based on the thorough medical examination and the x-ray diagnosis. 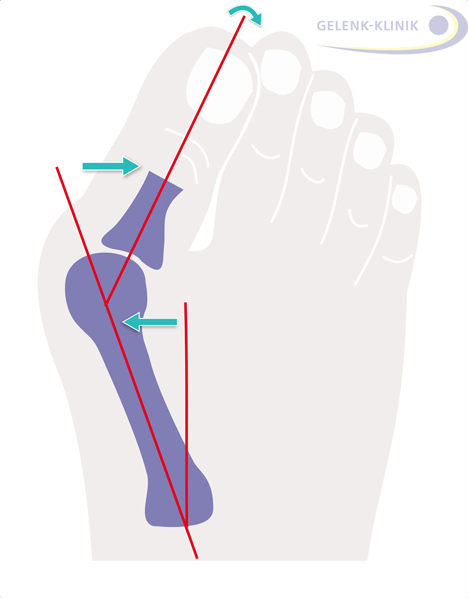 The various techniques are used depending on the severity of the hallux valgus misalignment (intermetatarsal angle = angle between the first and second metatarsal bone). These hallux valgus surgical methods apply to the anatomic areas shown below. Distal bone repositioning is the preferred corrective measure for hallux valgus. As specialists we always strive to operate with as little repositioning of the bone and scarring as possible. Our goal is to correct hallux valgus as soon as possible using only soft tissue procedures. To date this is not yet entirely possible: Adapted screws and implants for fixing the bones are usually still used. Minimally invasive surgery is "distal repositioning": so the big toe is repositioned starting at the metatarsophalangeal joint ("distal"). We particularly like to use this surgery for mild to moderate misalignments of the big toe. 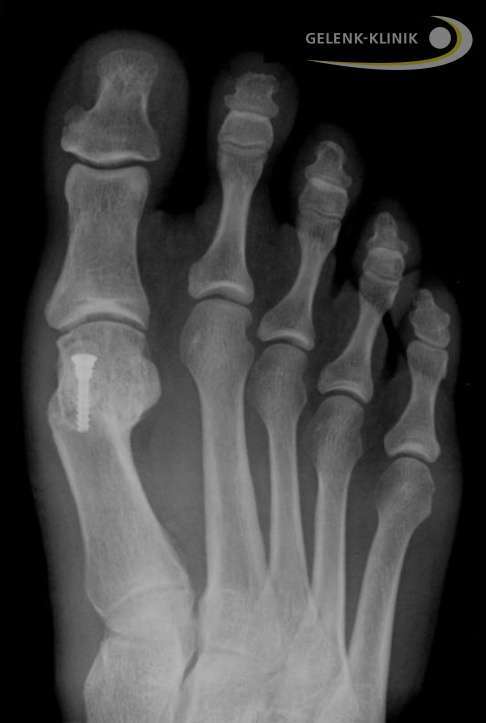 By using compatible titanium screws, this hallux surgery can usually forego follow-up surgery to remove the screws. The screws can remain in place without causing problems. This cosmetically very favourable procedure with minimal scarring is used for mild to moderate hallux valgus deformities. If arthritis of the metatarsophalangeal joint (hallux rigidus) is already present due to the hallux valgus deformity, however, this minimally invasive procedure can no longer be used. In this case, the procedure must include treating the metatarsophalangeal joint. What is the procedure used in minimally invasive hallux valgus surgery? Only two small skin incisions are made at both sides of the big toe. The small incisions hardly involve the soft tissue. This reduces the healing time and rate of post-operative complications - compared to open hallux valgus surgical methods - even more. The minimally invasive hallux valgus surgery realigns the crooked foot ray using small instruments, similar to dental instruments. In another step a small incision opens and widens the joint capsule, which is often shortened due to hallux valgus. This allows the joint capsule to provide the space required by the normal alignment of the big toe. This "minimally invasive" method has several advantages compared to the other - also minimally invasive - hallux surgery methods. Injury to the soft tissue is significantly less than with other osteotomies. This greatly reduces the healing time and the time until the patient reaches full mobility. Older patients especially benefit from this: They return to mobility sooner. Less injury to the soft tissue also significantly reduces post-operative swelling of the foot compared to other procedures. Planning the corrective angle in preparation for removing a wedge of bone. If the phalanx of the foot is misaligned in front of the metatarsophalangeal joint (hallux valgus interphalangeus), a so-called Akin osteotomy may also be performed. During Akin osteotomy the big bone of the big toe is repositioned beyond the metatarsophalangeal joint (metatarsus interphalangeus). The change in direction through repositioning surgery. Akin osteotomy often does not address the actual cause for the hallux valgus deformity: The misalignment of the metatarsal bone. Since it only corrects the big toe, we therefore typically use Akin osteotomy in conjunction with other hallux valgus procedures. With Akin osteotomy the repositioning is always achieved by removing a wedge from the phalanx of the foot. The phalanx of the foot then grows back together in a new, desired position. Correcting the alignment following Akin osteotomy also allows the pull of the tendons in the big toe to be normalised again. The Chevron osteotomy is suitable for moderate hallux misalignments. Applying the Chevron method requires arthritis in the metatarsophalangeal joint to be no more than moderate. 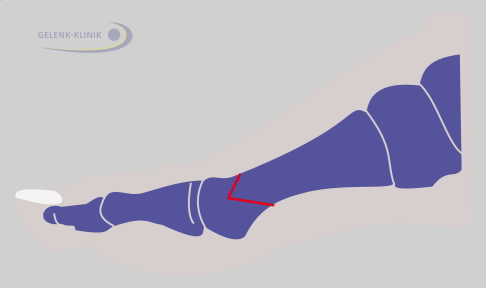 With the Chevron method a V-shaped wedge is removed at the level of the metatarsal head. The metatarsal head is moved outward and secured in place with a screw (titanium). The joint capsule is gathered at the inside to facilitate the regular orientation of the big toe. In mild hallux valgus deformity (< 17°) there are no significant changes to the joint yet (e.g. arthritis in the big toe joint). In this case Chevron osteotomy is very suitable. So Chevron osteotomy is used for mild to moderate types of hallux valgus. With Chevron osteotomy, first a small skin incision is placed across the metatarsophalangeal joint at the back of the foot. Then the tendons and the joint capsule, shortened due to the hallux misalignment, are detached and widened (soft tissue procedure). The shrinking of the tendons and joint capsule intensifies the misalignment of the big toe in hallux valgus. Then the protruding ganglion is ablated using a small saw or a chisel. An incision is placed at the first metatarsal bone at the level of the metatarsal head. 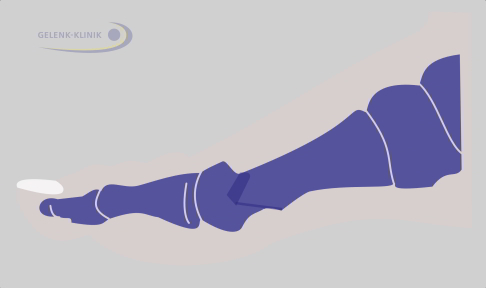 The metatarsal head is moved to the correct position, outward toward the small toe, until it lies below the sesamoid bones. The next step in the Chevron osteotomy is to secure the phalanx of the foot in place with a self-tapping titanium screw or wire. Then the joint capsule is tightened. The small titanium screws usually remain in the phalanx of the foot: They typically do not need to be removed. Follow-up surgery for hallux valgus surgery to remove the screws is usually avoided, if possible. However, if the titanium screws do cause problems, they can be removed after no less than three months through minor outpatient surgery. More severe misalignments often also involve changes to the joint at the joint capsule. Soft tissue surgery is therefore typically performed along with the repositioning of the bone. In Chevron osteotomy the lateral shift in the big toe is limited. To prevent relapses, it’s advisable to review the result of the hallux valgus correction during surgery using an image converter. This allows the specialist to review the exact position of the sesamoid bone. Scarf osteotomy is for moderate to severe hallux valgus deformities. The metatarsal bone of the first foot ray is visible on the inside of the foot following a skin incision. During the osteotomy it is cut in a Z-pattern (repositioning of the bone). It is then secured in a new direction using small screws. Here, a soft tissue procedure (gathering) of the joint capsule of the metatarsophalangeal joint may also be required. The so-called Scarf osteotomy is very well suited for correcting moderate to severe types of hallux valgus (from 17° to over 40°). Scarf osteotomy can also correct the rotation in the longitudinal axis of the big toe which often occurs in hallux valgus. Scarf osteotomy also combines the correction of the variance in the bone in hallux valgus with surgery of the soft tissues (tendons and capsule). In scarf osteotomy the skin incision is placed at the inside of the foot, from the base of the toe to the base of the metatarsal bone. Then a Z-shaped wedge is sawn out at the side, at the diaphysis of the first metatarsal bone. During Scarf osteotomy the part of the big toe with the joint - the so-called metatarsal head - is moved outward along the cut edge. This allows it to be moved to the correct angle. To allow this shift without tension, the tendons pulling the big toe toward the middle, is moved. The outside of the joint capsule which is also deformed in hallux valgus is released. The bone is then secured with two small titanium screws. The extensive bone contact allows the bone to heal well. The titanium screws typically remain in place and do not require removal. However, if they do cause problems, the screws can be removed after no less than three months through minor outpatient surgery. Advanced arthritis of the metatarsophalangeal joint (MTPJ) requires surgery. With joint-preserving cheilectomy the metatarsophalangeal joint can be cleaned arthroscopically and bone spurs removed. With an arthrodesis of the metatarsophalangeal joint is fused. A metatarsophalangeal joint can also be treated with a hemi-prosthesis of the metatarsophalangeal joint. The Lapidus arthrodesis is considered in very severe cases of hallux valgus deformity with concurrent arthritis or instability in the metatarsophalangeal joint of the first metatarsus with the tarsal bone. Lapidus arthrodesis is particularly helpful for major misalignments of the big toe with a particularly large intermetatarsal angle (>40°). Lapidus arthrodesis can also be used for arthritis of the tarsometatarsal joints. Chronic pain even after surgery. Painful irritation due to screws or wires. Lesions due to redistribution of the load when walking. Stress fractures due to the load change following surgery. The possible benefits and complications of hallux valgus surgery must always be carefully deliberated. In international studies on this topic about 80% of patients felt very well following surgery. About 10%-15% felt better than before surgery, even if they still had problems. About 5% of all patients in the studies experienced no improvement. The more experienced the surgeon, the greater the likelihood hallux valgus surgery will provide a good result. In our experience, intensive follow-up work to hallux valgus surgery with foot exercises significantly improved the result. The surgery only causes minimal injury of the soft tissue: Patients return to full resilience sooner. The big toe joint can be moved immediately following surgery. Using a special forefoot decompression shoe allows the foot to bear full weight immediately following surgery. The fixing material from the bone correction surgery can usually remain in the body. It typically does not pose any problems for the patients and in rare cases where it causes irritation the material can be removed with a small outpatient procedure. Fig. 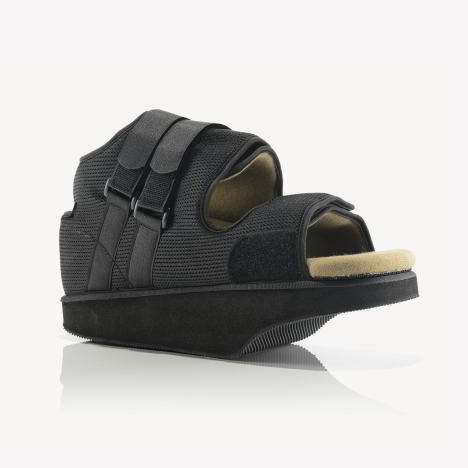 10: Following hallux valgus surgery, patients are immediately mobile again using a special forefoot offloading shoe. This shoe shifts the entire bodyweight to the heel. This also means patients are immediately able to travel again. But patients should also elevate their foot as much as possible whilst the wound is healing to prevent swelling. The healing process typically takes three to six weeks. The more severe the misalignment, the longer rehabilitation will take. An x-ray examination provides accurate information on the condition of the operated joint during the follow-up appointment, about four weeks after surgery. All of the corrective surgeries for hallux valgus we perform allow for functional follow-up treatment with full weight bearing, using a so-called forefoot decompression shoe, which in turn significantly lowers the risk of thrombosis. g hallux valgus surgery. The special forefoot decompression shoes must be worn for a period of four to six weeks. Nevertheless the foot should also be elevated and rested as much as possible following hallux valgus surgery: This promotes faster healing. Eventually a redression splint can be used at night. After approx. five more weeks wide shoes may be worn again. Post-operative foot exercises are vital for muscular balance and to stabilise and strengthen the foot. Self-massaging the arch with a soft tennis ball is highly recommended. Incapacity for work depends on the healing process and the profession. How long does hallux valgus surgery take to heal? Healing is complete after four to six weeks. Incapacity for work, however, also depends on your job: A standing job requires more time off than a sitting job. Can I walk after hallux valgus surgery? Using a forefoot decompression shoe you can walk immediately following surgery. This forefoot decompression shoe prevents the foot from rolling off across the big toe. Is the foot immobilised following surgery? The foot is not put in a cast or immobilised following hallux surgery. The big toe also remains passively flexible. When can I return to wearing regular shoes? Even after completing follow-up treatment with the forefoot decompression shoe you should wear soft, comfortable and wide shoes for another four to six weeks. Hallux valgus on both sides: Is simultaneous surgery on both feet advisable? We only want to offer simultaneous surgery of hallux valgus in emergencies. Normally, having one healthy foot is very important to the rehabilitation of the operated foot. If surgery is required on both sides, a period of three months between the procedures is sensible and should not be less than that.